Recently I added Adsense Auto Ads to my genesis theme and I just want to tell you how easy it all was. But before we go, let me first introduce you to Adsense Auto Ads, perhaps the most innovative kind of ad type in the industry. You just have to place one piece of code on your website and Adsense will automatically identify best locations on your blog and place ads on your behalf. You no longer need to mess up with a lot of different ad codes of different ad formats. Easy to Use and Save Time- Since you have to place one little code on your website, it is not only easy but also time saving. If you want or do not want to show a particular ad format, you can turn it on or off from your adsense account like we do in Infolinks ad network. Google Adsense Knows it Better – Beginners like me don’t know where should they place ads for optimized profit and best user experience. Let Adsense decide ads placement on your behalf because it knows better. Increase Revenue and Improve User Experience- Auto ads put ads where they are most likely to be clicked. Also it would be great to utilize the long empty spaces without ads in long articles. Note – If you already have Adsense Ads placed on your blog, you don’t need to remove them. Auto Ads will take into account all those. Or you can remove some low earning ads. It’s entirely up to you. Select Get Started. 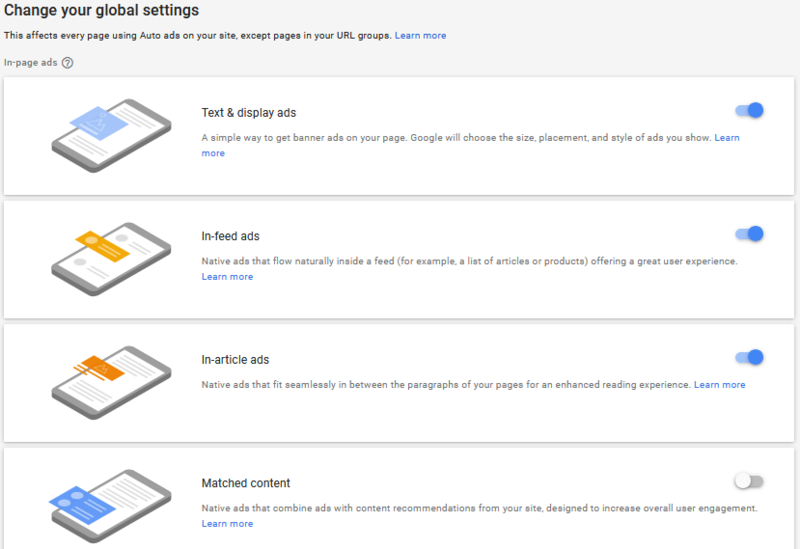 On the Choose Your Global Settings page, Select all the ad formats you want to show on your website. Click on Save. You can also change Global settings later. You have to place this code between <head> and </head> tags of the pages you want to show ads on. 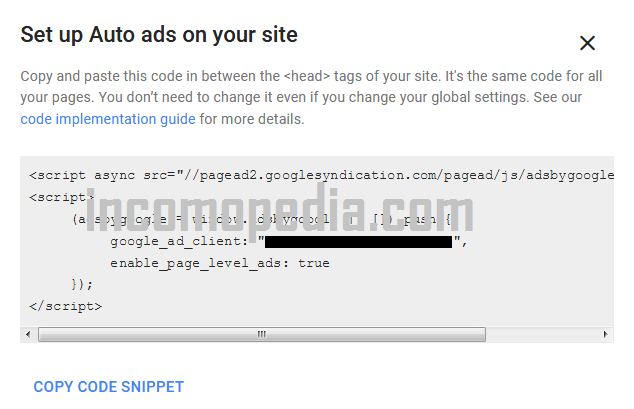 Enter Your Google Adsense Publisher ID in recommended format and Save Settings. That’s it. No need to place any code anywhere. Just make sure you have configured Global Settings in Your adsense account. You can find You Adsense Publisher ID in Account Setting of your Adsense account. Click on Save Changes. You are done. Ads will start appearing in few minutes. You will see a box to enter your Adsense Publisher ID. Enter Your Adsense Publisher ID in Required Format. Wait a few minutes and your adsense ads will be live on your website. 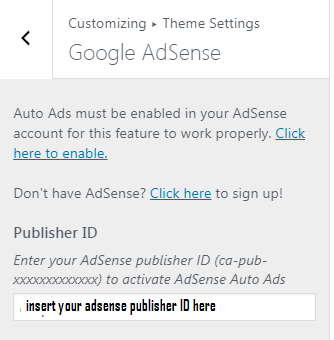 So these were a few ways how you can enable Adsense Ads in any genesis theme using Global ad code or Publisher ID. Hope you find it easy and useful. Share it among your friends.